By combining an old world sense of art and craftmenship with state of the art computerized embroidery, we strive to produce apparel and gift items of lasting and great beauty. We like to say that our specialty is custom embroidery. Whether designing a one-of-a-kind heirloom wedding gift, making sure that your company's logo comes out just right, or stitching one of our stock designs to order so that you can get the right color and size, we try to provide the highest level of personalized service possible. Here are a few of our customers' comments about our work. 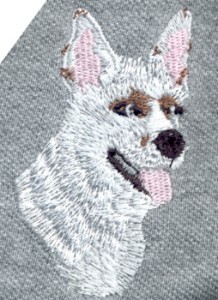 The art of taking a graphic image and turning it into a computerized embroidery design is called 'digitizing'. A wide variety of logos, graphic images and even photographs can be transformed into stunning embroidery. Take a minute or two and browse around our site to look at some of our original designs. The heart and soul of our business, our Judaica allows us to help add beauty to people's homes and share in their spiritual hopes. We offer an eclectic collection of beautiful and unique Jewish gift items. Included among our stock design and custom services are our unique embroidered 'Moroccan' mezuzah cases and our heirloom custom challah covers. 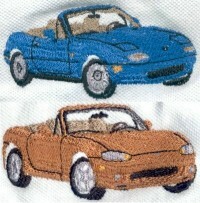 Our detailed and accurate embroideries of popular enthusiast cars will amaze you. If you have a custom ride, we can put it on your choice of apparel. We also offer custom embroidery services for upholstery and can manufacture custom floor mats cut and sewn to your pattern with your graphic design custom embroidered. We can take your logo, or just about any other graphic, and turn it into a professional and eye-catching embroidery image on a wide variety of apparel items. Many small businesses would like to have embroidered logoware but think that it's too expensive. That's because most embroidery shops charge a digitizing or setup fee of $75-$150 and have high minimum purchases. We do not charge you a digitizing fee and you get to see the finished design before you order any apparel. You submit the graphic and we do the design. If you don't like the results, you don't owe us a thing. That's how confident we are that our design work will impress you. Once the embroidery design is approved, we'll stitch as few as one half dozen items. Music is one of our passions here at Rokem. We have eclectic musical tastes, which are reflected in both our licensed materials and our original designs. 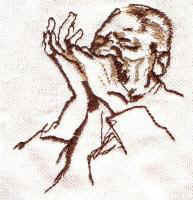 We are proud to be authorized by Peter Himmelman to sell apparel embroidered with his artwork. Rokem Needle Arts is also the home of official Kamp Kimock apparel for Steve Kimock fans. 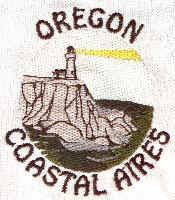 Our embroideries are an attractive way to generate funds for schools and youth groups. We can put your group's logo or graphic on a wide variety of apparel and promotional items. 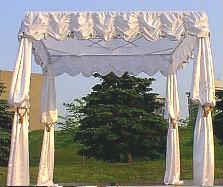 We can contruct a beautiful chuppah that will be a family heirloom for generations. We can help you add beauty to your dining room, kitchen and bathrooms. Simple but elegant initials on a napkin. Reproducing wedding invitation monograms. Table linens to match the graphics on your tableware. Beautiful towel monograms in your choice of fonts. If you want to give a one-of-a-kind gift that will be treasured forever, we can take almost any graphic image, create an embroidery of that image and put it on your choice of a wide selection of apparel. We can do your sister's calico cat or your cousin's '57 Chevy. We can even put your grandchild's picture on a sweater.